Your analysis, Mr Worf – Look behind you, a Three-Headed Monkey! 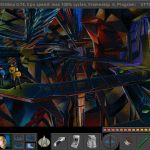 Star Trek: The Next Generation – A Final Unity was released in 1995 by Spectrum Holobyte (later known as MicroProse). 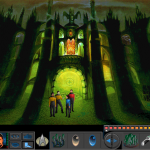 At a time when most Star Trek games, notably those from Interplay, were based off the original series, the game invites us into the TNG universe with a compelling mix of action and classic adventure gameplay. The game opens up to the Enterprise D encountering a Garidian warbird chasing a small group of rebels. It turns out these Garidians are yet another offshoot of the Romulan Empire, which is why they share their ships and technology. You have a choice to interfere and beam the rebels aboard, but as soon as you save them you find yourself locked in battle with the Garidian warbird. 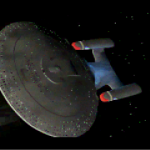 After you photon-torpedo them into oblivion (hey, this is the Enterprise after all!) you learn of an ancient scroll that has the power to unite the Garidian people. In the course of travelling across the neutral zone in search of the artifact you stumble across the remnants of the ancient Chodak – a race which ruled the known universe millennia ago, and ultimately discover their most powerful weapon, the Unity device. Similarly to earlier Interplay titles, Final Unity has two distinct components to its gameplay: first, there is the ship mode which allows you to converse with your bridge officers, check out topics in the computer library, select navigation goals and most importantly fight other vessels. As you travel the galaxy, you are contacted by Starfleet to update your objectives and evaluate your ongoing performance. Despite being a bit cumbersome in combat, the controls of this mode are actually quite intuitive and do not require much time to get used to. The developers did a great job capturing the feeling of a typical TNG episode – getting insight from Troy on an alien encounter, or discussing a tactical situation with Worf plays out exactly like it did on the show. That said, like the show these parts can a bit talky. 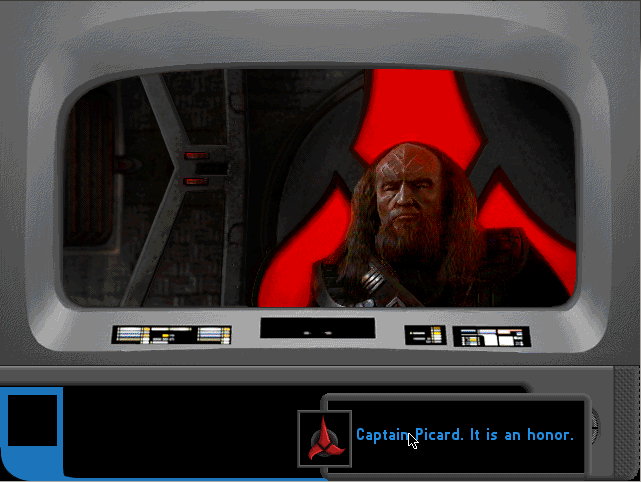 Thankfully, all of the show’s actors, including Patrick Stewart, reprise their roles in the fully voiced dialogs. The overall musical score is also quite formidable, with some memorable midi pieces throughout the course of the game. 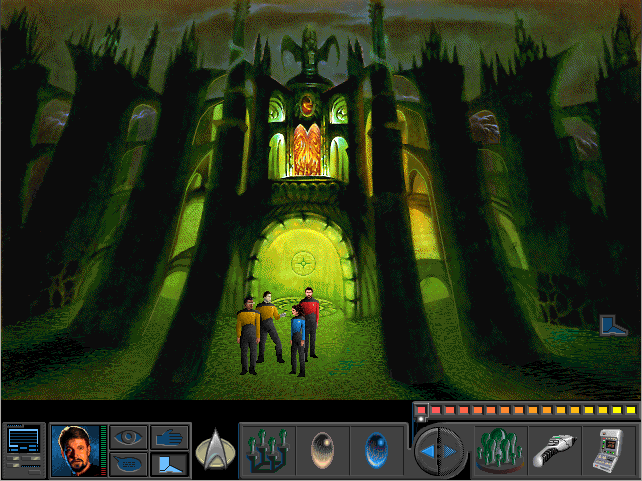 Whenever you start an away mission to a planet or station, the game switches to its second mode of play: after selecting up to 4 crew members to beam down, you control them in classical 2D point & click adventure manner. Your characters interact with their environment using “Look at”, “Use/Take”, “Talk to”, and “Walk to” commands, as well as items from their inventory including the obligatory tricoder and med kit. Since all characters share one inventory, there is no need to juggle items around much. 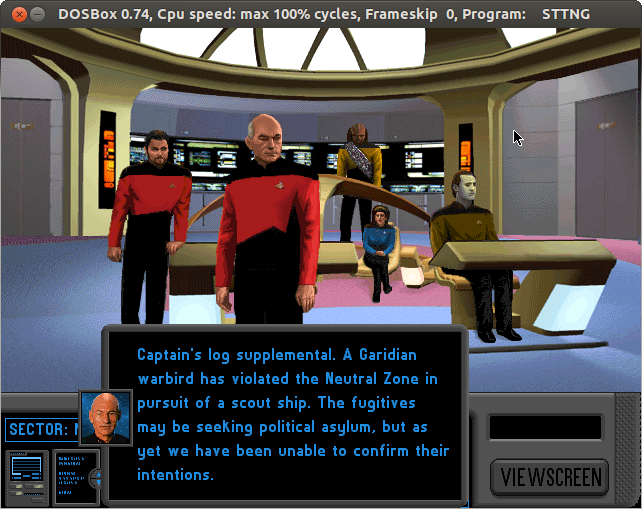 In fact, I found myself playing most missions with just one character, unless a specific puzzle required the skill of a particular crew member, for instance when Dr. Crusher was needed to heal a character. Despite this, the characters do have slightly different reactions to most things in game, so it can be quite useful to approach situations multiple times with different roles. The puzzles themselves are not particularly difficult, even though some of them can require a bit of trial and error – mainly because it wasn’t always clear to me what I was actually trying to accomplish on a given mission. Especially early on, some of the plot lines are a bit convoluted and had me backtracking quite a bit, which was less than pleasant given the low movement speed of the characters in this mode. These slower moments are balanced fairly well though overall. Starting with the 2nd act of the game, the Romulans attack, which makes for some great cut scenes, and even greater space combat. 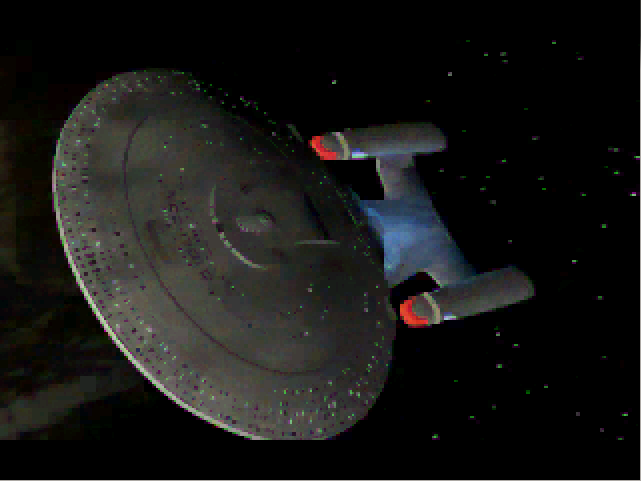 When fighting the player can have Geordi LaForge and Worf automatically take over ship repairs and combat maneuvers, respectively, or manage everything by hand. 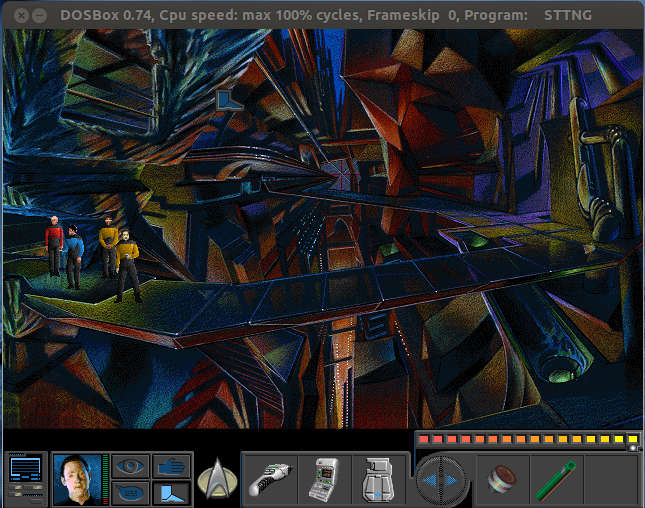 I’d recommend automating the former at least, as things otherwise can get pretty hectic – and who wants to spend time in engineering fixing the warp core all day long anyway? 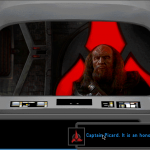 No mission is quite like the next: you’ll find yourself solving philosophical puzzles, then chasing a Ferengi trader, and finally fighting Romulans side-by-side with a Klingon warship. Throughout all of this, there is a strong overarching plot and sense of a living world. I especially liked the feeling of peaceful exploration of the initial phase of the game, and was quite surprised by the banter between some of your crew, later on in the game, making references to events from previous missions and the TV show. There are certainly some elements of the game that could be improved: for one, there are a number of ways to get stuck in an unwinnable game state – for example by picking incorrect items in one mission. Since you can save and load the game, this is mostly a minor annoyance. What I found more frustrating was that some missions did not have a clear indicator that they were over, so I spent quite some time retracing my steps to see if I had missed an item or interaction, until I realized that I could just beam back up to the ship. Finally, I hope that whoever came up with the design of the Chodak race lost their job after this game – what were they thinking making them look like humpty-dumpty with a frog face? 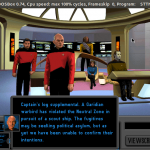 Overall I found A Final Unity to be the closest that a game has ever come to recreating the look and feel of The Next Generation – the combination of archaeological puzzles, Romulan plots, and a good dose of Star Trek philosophy make for a compelling story reminiscent of the show’s episode “The Chase”, and the gameplay has a enough variation to it to keep you hooked for the 10 hours it takes to solve the mystery of the unity device. I didn’t destroy the Garidian warbird! So many choices, so many possibilities!